This Monday I attended the University Science and Technology Librarians’ Group (USTLG) Spring meeting on Information Literacy. 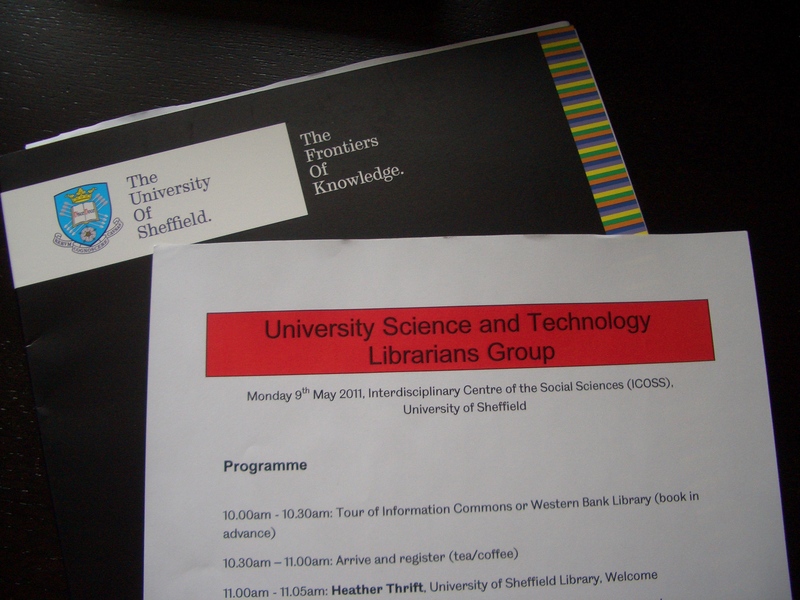 It was my first USTLG meeting (regular blog readers will have gathered that we try and send at least one science librarian to each) and was at the University of Sheffield, where I studied for my MA in Librarianship. The full information literacy presentations are available on the USTLG website. The talks fell into three themes: two on researcher support, two on outreach, and two on online tutorials, alongside a presentation from the British Standards Institution, which sponsored the lunch. I’ll tackle the talks in terms of theme, rather than in the order they occurred. Moira Bent, from the University of Newcastle, spoke about the revised version of the 7 Pillars model of Information Literacy. This model, well known in the library world, mapped the different skills an information literate person should possess. The revised model addresses some concerns which have been raised in recent years: it is no longer linear, the focus is not just on skills, and each ‘pillar’ has a simple name (Identify, Scope, Plan, Gather, Evaluate, Manage and Present). To further increase the model’s ease of application, a ‘research lens’ has been produced: looking at which skills and attitudes researchers would find productive under each pillar. The lens draws some of its terminology from the Researcher Development Framework, the UK’s widely-endorsed model of researcher development, in order to ensure its relevance. Moira emphasised that she was keen to use other ‘lenses’ to more increase the accessibility of the model in the long-term, perhaps for schools, undergraduates, or the workplace. Further pursuing this theme, Sheila Webber, from the University of Sheffield, spoke about the influence of PhD supervisors on information literacy. She related Brew (2001)’s model of conceptions of research and Lee (2008)’s work on conceptions of supervision to simply demonstrate how a supervisor’s views were likely to influence the types of training they directed PhD students towards. She also made the interesting point that information literacy might not look the same in every field: a small field might be relatively easy to keep up-to-date with, while other PhDs might require a broad interdisciplinary approach and need a student to access many different tools and literatures. The two talks on outreach looked at science / technology librarians working with academic departments: one from Evi Tramatza at the University of Surrey, and one from Elizabeth Gadd at Loughborough University. Evi’s was a real success story, about the work she’d done to embed herself into the departments she supports using a focus on shared ground, pilot lectures and the support of the wider library to make sure she delivered on her promises. Elizabeth talked about a more specific contribution she’d made towards improving teaching for a Civil Engineering literature review assignment. Elizabeth’s talk really emphasised for me how useful evidence can be in developing teaching: she’d used simple measures of the quality of the reviews before and after the teaching was introduced to demonstrate its impact, and was building upon this with other departments. You can see more of the evidence she used in Loughborough’s Institutional Repository. Lastly, the two talks on online tutorials. The first was David Stacey, from the University of Bath, talking about the library’s role in creating an online tutorial on academic writing skills. This was a great illustration of how different specialists across the university (including the library and a Fellow from the Royal Literary Fund) had worked together to obtain funding to create this helpful resource. Unfortunately the tutorial is not currently accessible to those outside Bath (there’s some screenshots in his presentation slides) but they may produce an Open Educational Resource (OER) in the future. The second, I already knew a little about, as Leicester is an observer on the project. This was the East Midlands Research Support Group (EMRSG), represented at USTLG by Elizabeth Martin from De Montfort University and Jenny Coombs from the University of Nottingham, who have been working together to produce a resource for researcher training. Again, this project was a triumph for collaboration, with four different universities – Loughborough and Coventry being the other key players – working together to get funding. I was really pleased to see how far the project has come since the last meeting I attended: they have developed a fantastic resource, with videos of senior researchers explaining core concepts and plenty of interactivity. Again, screenshots are available in the presentation slides right now, but the group intend to make an OER available in Jorum and Xpert in the future. Overall, this was a great event, with good breadth, and plenty of practical ideas to bring back (particularly the focus on evidence and collaboration). I’ll look forward to my next USTLG meeting. This entry was posted on 16 May, 2011 at 1:09 pm	and is filed under Meetings, Research Support, Subject Support. Tagged: information literacy, ustlg. You can follow any responses to this entry through the RSS 2.0 feed. You can skip to the end and leave a response. Pinging is currently not allowed.